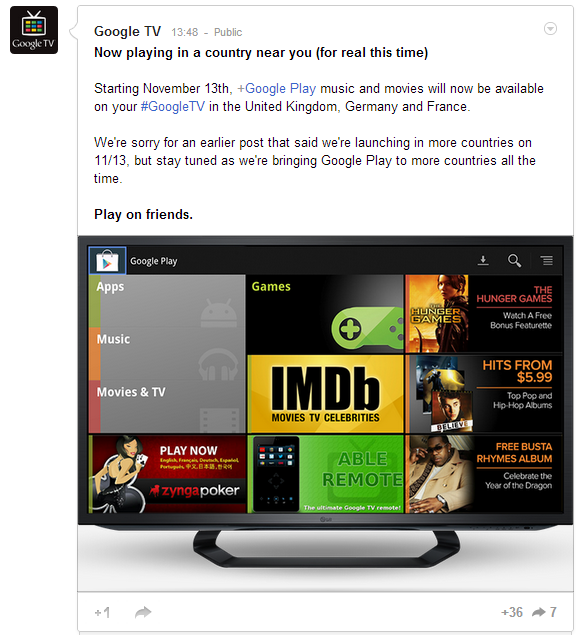 According to a post on Google's official Google+ page for Google TV, the Web-enabled set-top box will soon get access to Google Music and Google Movies through the Google Play Store. Update: Google has back-tracked on its original Google+ post, which has now been deleted. In a new post, Canada and Australia have been taken off the soon-to-launch list for Google Music and Google Movies. Google apologised for the mistake: "We're sorry for an earlier post that said we're launching in more countries on 11/13, but stay tuned as we're bringing Google Play to more countries all the time." There is currently only a single Google TV product available in Australia — the Sony Internet Player with Google TV — but it is likely that Google's introduction of the new services will also apply to Google's Android smartphones and tablets in the future. Google Music is a cloud-based streaming music player, bridging the gap between users' personal music collections and online music stores. Songs can only be bought — there is no unlimited music subscription in the style of Rdio or Spotify — and pricing in the US ranges from $1.29 to $0.69 per song, with 'hundreds' of free songs also available. Users can also upload up to 20,000 of their own songs to their personal Google Music service — metadata and hash checking matches most users' music, automatically drawing from Google's catalog of music to add tracks without requiring slow and data-heavy uploading of each track. Google Movies has been available to some extent in Australia since the end of April, through the Web browser version of the Play Store and dedicated smartphone and tablet apps. 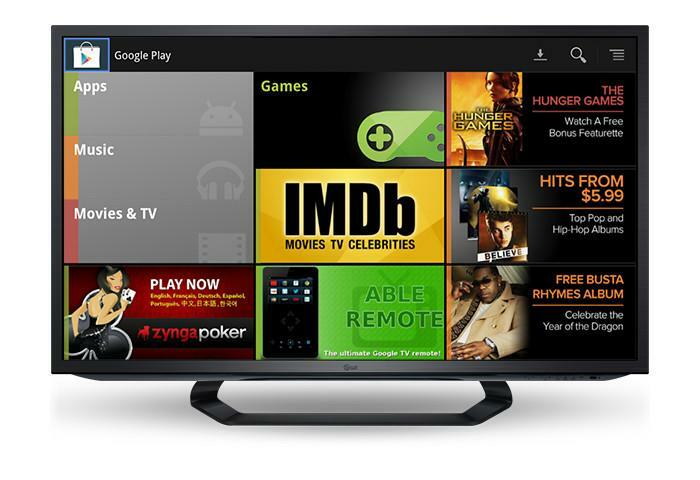 When it launched, the Google TV service wasn't able to access the rental movie service; this is set to change with the introduction of an app designed for the 10-foot GUI of the Google TV set-top box. The changes to Google Music and Google Movies through Google TV will also apply in the UK, Canada, Germany and France as of November 13.